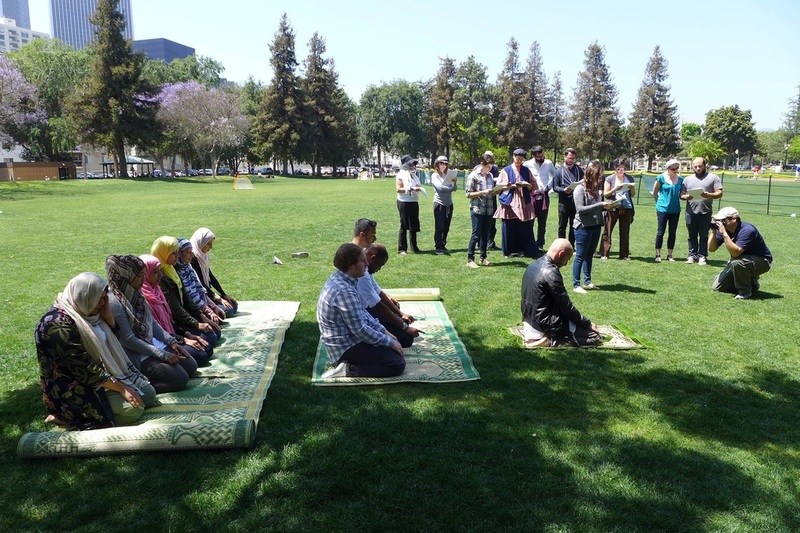 On May 3rd, 2015, starting on the beach and ending on a rooftop in Downtown LA, this group of approximately 20 Jews and Muslims traveled via public transportation to pray together in five different locations across the city of Los Angeles. We gathered people as we went until almost 100 supporters joined us for evening prayers at City Hall. We met on the beach near the Santa Monica Pier before dawn, and got ready for prayer. Kerry and Omar lead the Shacharit (Jewish) and Fajr (Muslim) morning prayers. After finishing our prayers, we played, ate breakfast and talked with some interesting folks near the picnic tables. We made our way to Roxbury Park where we prayed Duhr (noon prayers) and recited Psalms (Biblical poetry that Jews often recite as prayers beyond their three daily prayer services. A few more of our friends and family members joined us there while Jason and Cindy lead us in prayer. Our next stop was Exposition Park. After disembarking the Expo line, we found ourselves walking through a beautiful rose garden on our way to the a spot we had chosen for Mincha/Asr prayers (afternoon prayers). As we gathered ourselves again between the African-American Museum and the California Science Center, we were joined by a few more friends and supporters. This time, Jason lead prayers with Tuli. As we were in prayer, the Science Center closed for the afternoon and exiting visitors streamed passed us, taking a quiet interest as they moved on. We, ourselves, moved on to City Hall not long after we finished prayers. We knew that many people were anticipating joining us at City Hall, and we needed to get ready to receive them. People came from all over Los Angeles and Orange County to pray with us on the steps of City Hall in the City of Angels! Kerry and Mia lead us through exercises that helped us reflect upon why we had gathered and encouraged us to get to know one another a bit. Ahlam and Andrea offered intentions for our prayers. On the train from Expo Park, Omar -- originally from Garland TX -- began receiving texts from friends and family about the situation unfolding there. Omar and Andrea prepared to lead everyone in prayers that felt even more significant than they had at the beginning of the day. People came with their friends and with their family. Together, we prayed our evening prayers: Maghreb and Ma'ariv. Following our prayers, we took some time to connect with one another, and those gathered with us -- and then we made a brief change of venue for dinner and our final prayer. On the roof of a nearby apartment building, we recited our nighttime prayers: Isha (the nighttime prayer) for the Muslims and Piyyutim (liturgical poetry) for the Jews -- under the stars and surrounded by the downtown skyline. In our video documenting the day, you will have an opportunity to hear interviews with project members about what the day -- and this project -- has meant to them. You can also read some reflections here. We hope that you will share the video and other links with people who you believe will be moved by this project. Our goal is to amplify the voices of peace and to challenge the conventional narratives about relationships between Muslims and Jews. We are developing resources to help communities across the globe create their own version of shared prayer. If you would like to support the project, please click here. Your donation will help us create educational materials and spread this project around the world -- we hope to make an impact beyond the day and beyond the boundaries of LA.